DHgate, online at DHgate.com, is your online wholesale destination for a wide range of discounted products. DHgate.com is the world's leading B2B online trading marketplace for goods manufactured in China, serving the world's small and medium sized businesses since 2004. DHgate offers a wide range of products including electronics, health & beauty, baby& maternity toys, computers & networking, jewelry & watches, sports & outdoors, home & garden, automobile & motorcycles, apparel, shoes, bags & accessories, and much more. 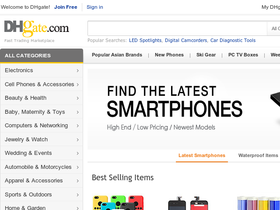 DHgate only offers top brands such as Samsung, iPhone, Android, Winforce, 17K, YishunBike, Lotoyo, and many more. Be sure to stop by RetailSteal.com for all the latest DHgate discounts, DHgate promotions, and DHgate coupon codes. Hurry over to DHgate and save $12 off your purchase of $200 or more with coupon code. Save up to 70% on the weekly deals happening now at DHGate. Click here to shop. Shop at DHgate.com and receive free shipping on select products, updated weekly. Be sure to stop by DHgate.com and save on top products. Shop DHgate.com and save up to 50% on lights & lighting deals. Save up to 50% on phones, tablets, and other electronics from DHGate. Click here for the latest special offers. Save up to 40% on the latest tablet PC deals from DHGate. Click here to shop.